New MIT-designed device brings hybrid technology to bicycles. 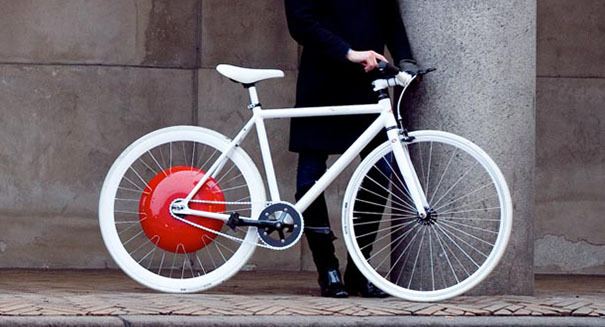 Finally, those brake-less bike messengers get knocked down a peg when it comes to the “cool” factor: The Copenhagen Wheel, designed by MIT group “Superpedestrian,” promises to reduce energy loss while giving the rider a boost when needed. What’s more, it’s a steal at just $699. No four-wheel hybrid on the market can boast that, provided riders don’t mind using their own two legs as the engine. The mechanism works like those found in cars like the Toyota Prius and other hybrids – when the driver breaks, that energy is converted and stored for future use. The device is designed to work with bike, be it a “fixie” or a multi-gear setup. Propelling the rider at speeds of up to 20 miles per hour over a range of up to 30 miles, the Copenhagen Wheel gives riders assistance when faced with long commutes, fatigue or just a particularly steep hill. All the rider may have to do is fully charge the removable lithium ion battery to guarantee maximum usage time. According to superpedestrian.com, the device isn’t meant to be used as a shortcut to bicycle travel, as there are no throttle or speed controls. Instead, the disc uses a series of complicated sensors and algorithms to assist the rider based on previously recorded speeds. This preserves the normal biking experience while enabling riders to bike faster, farther, and easier, though riders can adjust the level of assistance using the Superpedestrian smartphone app. “Effectively, the Copenhagen Wheel puts your bike online – at the center of your personal Internet of Things,” said Carlo Ratti, co-inventor of the Copenhagen Wheel and director of the MIT Senseable City Lab. How exactly the wheel does all this is proprietary information. “This is the secret sauce we’ve been working on,” Biderman said. Around a dozen sensors tucked away inside the module learn how the rider pedals as well as the topography he or she is riding on, Biderman explained. When the Wheel needs to kick in, it does so seamlessly, to integrate with the rider’s pedaling. The Copenhagen Wheel was featured for an entire season on the TV show “Weeds,” but it hasn’t been released as a product until now. It’s available for purchase now at superpedestrian.com, but the modules — which are individually handmade in Cambridge, Mass. — won’t begin shipping until early next year.